Today, as the owner and president, Bangs is responsible for the overall operation of the Tulmar group of companies, which consist of Tulmar Safety Systems Inc. in Hawkesbury, ON; Tulmar Manufacturing Inc. in Ogdensburg, NY; and Tulmar Technical Services in Montreal, QC. “The focus is on providing innovative safety solutions to the defence, security and aerospace communities,” he said. 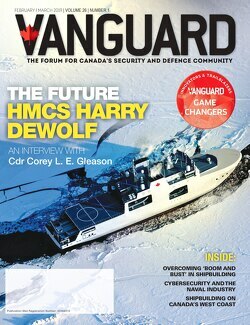 Here is the full interview with Vanguard. What is your role in your different companies today? Three years ago, I hired a chief operating officer (COO) overseeing all three companies and this has changed my focus significantly. Rather than getting involved in the day to day problem solving, I am focused on strategy, planning and networking within the defence and aerospace industries. I am on the board of the Canadian Defence and Security Industry of Canada (CADSI) and recently joined the SME committee of the Aerospace Industry Association of Canada. (AIAC). I continue to oversee the financing and banking arrangements for the group. On a personal note, when I was five years old, I was hit by a fuel truck. I remember being pulled from under the vehicle, placed in someone’s car and rushed to the local hospital. My right shoulder was broken in several places which resulted in a cast accompanied by a steel brace for several months. Early in my career, I worked as a business development officer for a packaging company. Part of my training was to accompany senior sales personnel on sales calls. On one such call, I called a competitor’s product “cheap”. Thinking I would get an excellent review from the sales associate, I got “raked over the coals” for using the word cheap. The lesson, you never refer to a competitor’s product as cheap or inferior, you stress the advantages of your own. What was your aha moment or epiphany that you think will resonate most with our reader, tell us the story? Entrepreneurs typically immerse themselves in the business. More often than not, hard work, long hours and dedication are the foundation for success for early-stage companies. However, as Tulmar grew I found it more and more difficult to be engaged in every decision and detail. Business growth stalled as I hoped that managers would take on responsibility and decision making. The aha moment was recognizing the need to take the time to work on the business and not in the business. This meant I had to purposefully carve out time to think about growth plans and strategy and what was needed to ensure sustainable and continued growth and profitability. I decided to join an external leadership group, TEC Canada, which provides executive coaching and a forum for interaction with other business leaders in a structured approach. This forced me to spend at least one dedicated day per month learning and working on the business instead of in the business. The outcome of this investment has been significant with far more focus on strategic and operating plans as well as leadership recruitment, growth and development. I realized that the single biggest constraint to growth wasn’t winning more customers but rather getting the right people on board to leverage and grow the business through their skills and contribution rather than just mine. This transition has been challenging as it feels like a loss of control but in reality, it has been enlightening and empowering as I can see the strength and longevity of the business with or without me. Step back and analyze your own journey, what is the takeaway you want to give to our audience? In my twenty-five years at Tulmar, I have experienced many business cycles. You must never give up and manage the business through all sorts of things. A few years back I did an acquisition designed to vertically integrate one of our defence capabilities. For many reasons, the acquisition went badly resulting in a very precarious situation for both me and the business. However, I learned from the experience and the management team at Tulmar is more robust than ever as they worked tirelessly to rebound from the misstep. Had we had a well developed and purposeful strategic and operating plan we would never have undertaken the acquisition. In hide sight, it was neither strategic nor accretive to our core business. I encourage all entrepreneurs to invest the time and energy to create and follow a strategic plan backed by an annual operating plan to guide execution. What is the one thing that has you fired up today? The innovation agenda is high on my list. We recently engaged in collaborative development to improve the ability of our XL life rafts, used by the Canadian military, to withstand the arctic environment. The process was long and challenging, however, we have developed a new inflation system, modifications to the existing design and vacuum-packed system. These modifications have allowed our customer (DND) to modify existing equipment and extended the life cycle by many years. The company has also taken advantage of an IRAP grant to develop an RF weldable/heat sealed version of our airline training slide. By experimenting with different fabrics and design, we will be able to offer a product with shorter lead times and more favourable pricing, notice I did not say cheaper. I’m very encouraged by the recent Defence Policy Review released by the government. The focus on a long-term commitment to the Canadian Forces backed by the drive to innovate will not only support our troops but also drive innovation throughout the Canadian defence industry. It was from Bill Tate, a former defence/aerospace executive and the very first chairman of the board of Tulmar. His advice was: “look after the personnel on the production floor, by treating them well the company will be rewarded in spades”. I took Bill Tate’s advice and make daily rounds of the production floor, stopping to talk to people. It is part of our culture at the company where “people come first”. The high-tech industry has an incredible mantra of innovation. It permeates the industry from the unbridled thinking of high-tech entrepreneurs to the investment capital that follows them. The industry’s tolerance for failure in the hope of big wins and breakthrough innovation is second to none. The accomplishments of innovators like Steve Jobs and Elon Musk are truly remarkable game changers for society to say nothing of the economic impact. And these are but two examples of the thousands if not hundreds of thousands of high-tech innovators each of whom embraces innovation and the risk of failure or reward of success that comes with it. If we could bring a fraction of this to traditional industries and manufacturing just imagine the outcome. How is your organization changing the game within your industry? Tulmar’s ability to take a holistic approach to solving client challenges has moved the business from being a “contract manufacturer” to a trusted partner forming an integral part of the value chain. We have really moved towards developing complete systems in a number of our product areas. Our significant expertise and investment in engineering resources allow our customers to work with us in the creation and delivery of innovative solutions. The industry benefits from this through innovation in design and manufacturing processes which enhance functionality and/or reduce costs. One example of this is working with one of our OEM customers. For many years Tulmar was the provider of textile solutions (seat restraints, seat cushions), however, we approached the client about managing some of their mechanical assembly supply chain. This resulted in taking over supplying the complete subsystem assembly including final testing. Now, the customer has a relationship with one supplier (there were many SME’s in the supply chain) and receives a complete system which is tested and ready for installation. We are pushing a similar agenda in our airline training products market where Tulmar is offering a “one stop shop” for the provision of cabin crew training products. This affords the training centres to free up valuable resources while offloading the design and production of products such as training slides, life jackets, seat belt restraints, fire/smoke hoods and cabin training door trainers. We’ve added a full-service cabin crew training centre infrastructure management service with guaranteed up time which in turn frees up additional resources for our clients. What are some of the biggest impediments to innovation for your organization or industry sector? The lack of tolerance for risk through the government procurement process is a significant innovation constraint. Typically, government requests for proposal or tenders are highly prescriptive leaving little or no room for innovative proposals or alternative solutions. The procurement process relies heavily on internal government innovation, sometimes in consultation with industry, which makes it difficult for small and medium-sized enterprises to contribute. What are the biggest impediments to innovation in today’s enterprises? Resources are always a struggle. There is little room in the competitive procurement process for the cost of innovation. Contracts and new business are awarded most frequently to the lowest price compliant bidder. Unlike the technology sector where risk capital is readily available for new ideas, the manufacturing and services sector have very limited access to risk capital for innovation. How has innovation become engrained in your organization’s culture and how it is optimized? Tulmar has some traditional products that have not changed much over the years so the innovation theme is recent for us. We have made it a point to hire young and innovative engineering personnel to replace personnel that have recently retired. The use of IRAP funding has also assisted in pushing our R&D program. Through my tours of the shop floor to my executive team meetings I’m hearing talk of innovation. The willingness to set aside budget and resources to innovate is permeating through our organization which is a testament to the strategic agenda we’ve set to innovate throughout the business. The defence industry has undergone much change. In the past, a contractor designed a family of products which was approved for a program and the program went on for years. Today, with smaller programs and much less funding, the challenge is to develop products that are price competitive and innovative. This results in enormous pressure put on the design, manufacturing and supply chain to reduce costs. The industry trend is to invest in state of the art equipment and implement lean manufacturing ensuring cost reduction. Looking forward, the trend towards smart or technology-enabled products will continue. Innovation through textiles that read and respond to their environments, communicate through interconnected devices and offer unique technology based enhanced performance for both man and machine will dominate the landscape. Focus on the team. With the right people and a solid strategic direction, success is inevitable. To transition a business, founders must be prepared to “let go”. This means building a team that can be trusted and empowered to execute on the strategic direction. To do this, founders must first take the time to “work on the business” and not just “in the business”.